2018. Hardcover and Paperback. 160 pages with 75 black-and-white illustrations. Heda Margolius Kovály (1919–2010) was a renowned Czech writer and translator born to Jewish parents. Her best-selling memoir, Under a Cruel Star: A Life in Prague, 1941–1968 has been translated into more than a dozen languages. Her crime novel Innocence; or, Murder on Steep Street—based on her own experiences living under Stalinist oppression—was named an NPR Best Book in 2015. In the tradition of Studs Terkel, Hitler, Stalin and I is an oral history of a renowned Czech author, whose optimism and faith in people survived grueling experiences under authoritarian regimes. 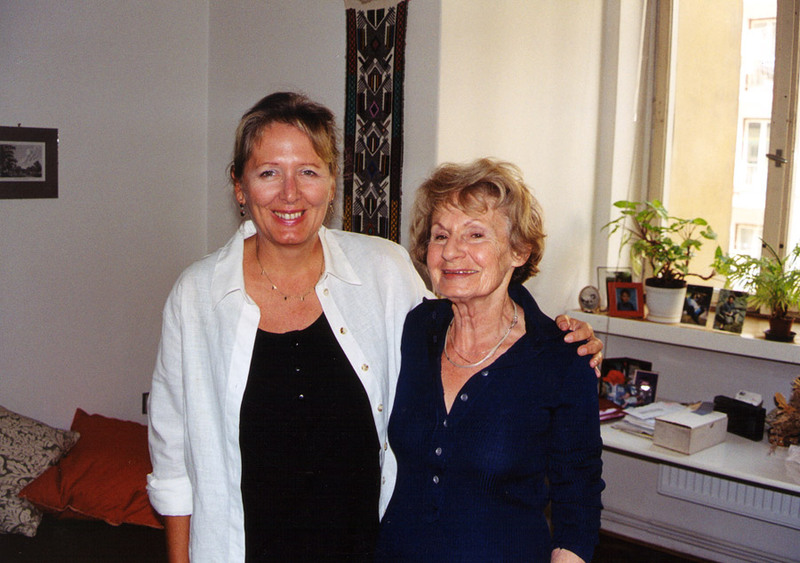 Based on interviews with award-winning filmmaker Helena Třeštíková, Kovály recounts her family history in Czechoslovakia, the deprivations of Łódź Ghetto, how she miraculously left Auschwitz, fled from a death march, failed to find sanctuary amongst former friends in Prague as a concentration camp escapee, and participated in the liberation of Prague. Later under Communist rule, she suffered extreme social isolation as a pariah after her first husband Rudolf Margolius was unjustly accused in the infamous Slánský Trial and executed for treason. Her son and translator of the book, Ivan Margolius, adds critical contextual information surrounding the trial and its recently uncovered documents and film footage. Remarkably, Kovály, exiled in the United States after the Warsaw Pact invasion in 1968, only had love for her country and continued to believe in its people. She returned to Prague in 1996. Helena Treštíková and Ivan Margolius give more context to the book and its publication in an interview on The Nomadic Journal. It is hard to imagine a reader who would not be inspired by the momentous life of Heda Margolius depicted in Hitler, Stalin and I. [… The book]is at once a harrowing journey, a kaleidoscope of images and sounds. If a reader truly hears the haunting words as if they are spoken one can begin to understand that this life and death human drama is not just about one survivor but a meaningful observation of an even more significant story about the bloody outcomes of extremism. Heda Margolius Kovály was a well-known writer and translator who survived the Auschwitz extermination camp and whose first husband, Rudolf Margolius, a deputy minister of foreign trade, was found guilty in the notorious Slánský show trials in what is one of the darkest chapters in Czechoslovak history. Kovály’s oral history should be required reading for anyone learning about the Holocaust and crimes committed by Czechoslovakia’s communist regime. It also offers a glimpse into Czechoslovakia’s First Republic. […] Her descriptions are unforgettable. Heda’s torturous path through some of the 20th century’s greatest calamities is rendered with deep wisdom and a poetic eye for detail. Her misfortunes, and her perseverance through them, make Hitler, Stalin and I both an important historical account and a testament to human endurance. Třeštíková’s interview and chilling newsreel footage of atrocities bring Margolius-Kovály’s story to life. Her combination of determination and luck renders her almost matter-of-factly told tale extraordinary. […] In Margolius-Kovály (who penned the 1997 memoir Under a Cruel Star: Life in Prague 1941–1968), she’s found a composed, eloquent yet spunky subject whose quietly upbeat nature is inspirational and infectious. Oral interviews can be a gold mine for historians, and this is no exception. Based on an interview with the late writer and memoirist Heda Margolius Kovály and the basis for a film shown on Czech television, this book stands out as one of the best examples of memoir literature. […] It has extraordinary momentum, reads in ‘one sitting’ and, were it not a depiction of real life events, could be described as a suspense thriller. […] The story is so engrossing and filled with such immediacy and realism that the narrator, speaking from the soul, instantly wins the hearts of readers. A story written by life itself. […] After all the hardships, Ms. Kovály remained someone with an open mind and many truths echo in her life story. The book is difficult to tear yourself away from until you finish the last page. This emotionally charged story, yet realistic and without embellishment, will not leave you in peace. In today’s political climate of rising extremist ideologies and nationalist tendencies, a new book, Hitler, Stalin and I, is an oral history that examines persecutions rooted in strong political rhetoric of exclusion. Czech author and Holocaust survivor, Heda Margolius Kovály [… gives] a panoramic view of life-long survival in the face of despair and violence, while retaining optimism and faith in the better angels of human nature. Kovály’s story is engrossing, immediate and real. Kovály speaks from within, from her soul and pulls us into her life. I actually read the book in one sitting because I did not feel I could or wanted to stop. Prepare yourselves for an emotional read. A compelling read, appalling and inspiring, tragic and hopeful. Heda’s voice comes through incredibly strongly and my admiration for her clear headed courage and determination is very deep. Full marks to the interviewer for her part in getting Heda’s testimony on the record. The words and tone of voice do not strike a false note. The translation reads simply and without affect. I cannot begin to imagine what reading and re-reading about Rudolf’s murder must have been like. What degrading times they were […] I am very pleased – if that is the word – to have read it. Heda had an enormous talent for expressing herself. She spoke with precision and was descriptive and witty in places. I admired her attitude and composure, even after she had such extremely difficult experiences. Nazism and Communism afflicted Heda’s life directly with maximum intensity. Nevertheless, she remained an optimist. A luminous testament from a dark time, Innocence is at once a clever hommage to Raymond Chandler, and a portrait of a city – Prague – caught and held fast in a state of Kafkaesque paranoia. Only a great survivor could have written such a book. Double lives, secrets, informers, microdots, and above all, lies . . . Set in post-war Prague, a repressive political maze, Innocence is a must-read, a psychological drama played out in crystal prose. Not only did Heda Margolius Kovály write an emotionally wrenching tale, she lived it during the 1950s Communist state. Innocence is an extraordinary novel. […] In 1985, Kovály produced a remarkable work of art with the intrigue of a spy puzzle, the irony of a political fable, the shrewdness of a novel of manners, and the toughness of a hard-boiled murder mystery. […] Just as few will anticipate the many surprises and artful turns of Innocence, a book sure to dazzle and please a great many readers. Kovály’s skills as a mystery writer shines, as she uses suspense, hints, and suggestions to literally play with the reader’s mind. […] Innocence is an excellent novel for readers who are up for a challenging, intelligent, and complex story – one that paints a masterful picture of a bleak, Kafkaesque, and highly intriguing time, place, and cast of characters. Although not out of love for Hegel, Heda Margolius Kovály makes a very Hegelian point: actions, as Hegel tells us in the section on Antigone in Phenomenology of Spirit – even seemingly small, meaningless actions – always reach beyond their intent; and the impossibility of foreseeing how the consequences will ripple outwards does not absolve us of guilt. As for innocence, the woman who went to hell twice wants her readers to know that there is no such thing. Capturing the fear and oppression of living in a police state, this dark novel, reflective of its time and written by a writer who lived her material, will enthrall noir enthusiasts and readers of literary historical fiction. Previously unpublished in English, this mystery by the late Czech translator and author of the memoir Under a Cruel Star vividly depicts Communist-oppressed 1950s Prague. […] That Kovály’s first husband was unjustly executed by the Czechoslovak Communist Party in 1952 gives her narrative of double lives and betrayal a painful veracity. Heda Margolius Kovály is the author of several books including the acclaimed memoir Under a Cruel Star: A Life in Prague 1941–1968 (Holmes & Meier, 1997) and the mystery thriller Innocence, or Murder on Steep Street (Soho Press, 2015). Helena Třeštíková has made over fifty documentary films. The film Hitler, Stalin and I, based on her interview with Heda Margolius Kovály, was first shown on Czech television in 2001 and subsequently received the Festival Award Special Commendation at the 2002 Japan Film Festival; the ELSA award for the best Czech TV documentary film by the Czech Film and Television Academy in 2002, and the Gold Kingfisher award for the best documentary film at the Festival of Czech Films, Plzen in 2003.